Welcome to the 34th edition of our company newsletter! We've decided to make it easier for you to enjoy all our latest events, developments and happenings, with this new design, so you have our news all in one place that you can boomark. So, relax, sit back have a cup of tea or enjoy a glass of wine and read on! Sir Richard Branson being honored at the Flight Path Museum @ LAX (with our friend Bill Miller (on the right) Photos © McCartney Multimedia. We were honored to attend and film the ceremony where Sir Richard Branson was presented with his plaque by Flight Path Museum Board of Directors President Lynne Adelman and Vice President Lori Keir. He joins a distinguished group of past inductees – pioneers and individuals who helped ensure Southern California’s world leadership in aviation/aerospace – including the first man to break the sound barrier, retired Air Force Brig. Gen. Chuck Yeager; entrepreneur, pilot and airline founder Howard Hughes; and Apollo 12 astronaut Pete Conrad. Other honorees include Orville and Wilbur Wright, Charles A. Lindbergh, Amelia Earhart, entertainer Bob Hope and astronaut Sally Ride. Steve Tyrell "A Song For You"
Steve Tyrell was surprised April 10th at his Cafe Carlyle opening night by Kevin Gore, president of Arts Music Warner Music group with a plaque celebrating Steve’s latest album “A Song For You” being #1 on the Billboard Charts. Al Roker & Deborah Roberts were in the Cafe for Steve’s fourteenth return to the legendary, intimate cabaret room in The Carlyle. “A Song For You” is a 12-track release that features Grammy and Emmy Award winner Tyrell’s takes on classic love songs by Van Morrison, Leon Russell, Jackie Wilson, Harold Arlen & Johnny Mercer and more. A Song For You furthers Tyrell’s vision of bridging songwriting from the rock era with that of the standards era, placing at its core the fundamental immortality of great songwriting. In 2005, after the passing of the legendary Bobby Short, Steve was asked by New York City’s Café Carlyle to take over their revered holiday season of November and December, which Mr. Short had not missed for 36 years. Our recent trip to San Diego courtesy of Lighthouse Strategies, BrewBudz and Tea Gallerie was enlightening, to say the least. 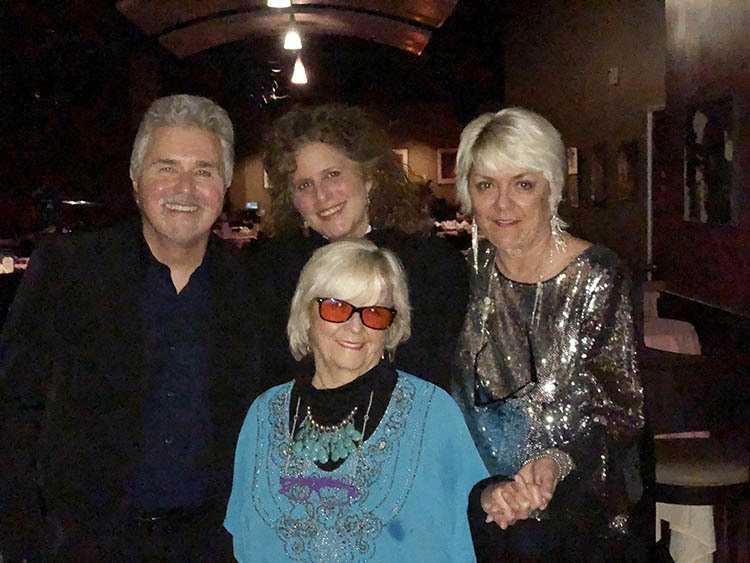 We introduced Mrs. McCartney's Teas and Wines brands to the boards of these pioneering companies, and had a great time at the "After Party" promoted by Sensi Magazine. When it comes to branching out with our Mrs. McCartney's brands, the sky's the limit. Literally. Thanks to Lighthouse and Sensi for making us so welcome and exploring brand extension possibilities with Mrs. McCartney's. By now you should be familiar with our artist Nick Marechal.We recently shot and produced Nick's first music video, entitled: "Charming Distraction", which was filmed at East West Studios in Hollywood, Playa del Rey and the Valley. The song has a very romantic feel to it, so we decided to cast an actress (Viviane Sambugaro) to play the part of Nick's lovely wife, and brand it as an official "Crooner" song. We since dubbed Nick "The Rock'n Roll Frank Sinatra". Judge for yourself. Click here for Video. What is TEAFLIX? Dr. Angie McCartney introduces her new show. Well, let Dr. Angie McCartney explain. Every Tuesday Dr. Angie McCartney pontificates on World Affairs and other matters in her 30 minute show on Facebook Live. Join her on Tuesdays 11:30 AM (PST) on Facebook! Click to watch the videos. Well that was the greeting we received in Staten Island at our last live stage show "Behind The Beatles" The Center of The Arts at the College of Staten Island hosted the show for excited east coast Beatles Fans on December 2nd, last year. Thanks to John Jankowski and Christina Werkmeister (from Kassel, much to Martin's surprise), who was the coordinating producer on behalf of the college, they all did a tremendous job putting it all together back stage. Special thanks to Tom Raider (John Lennon) and Morgan Cates (Paul McCartney) for making "Behind The Beatles" come to life musically. Thanks to all for coming out and seeing us. New websites are coming for: Jim O'Heir (Actor), Allen-Curry (Lawyers), Pacific Helicopters (Business), Joanne Tatham (Artist). Stay tuned for launch announcements. In the meantime.. Thinking about a new website, or updating an existing one? Then please click here and tell us about your project. We recently formed a strategic partnership with Kiwi Tech to provide branding and digital agency services to their partners and investments. We attended their "Demo Days" presentation and luncheon at Cooley's law offices in Santa Monica, CA. It was a day where entrepreneurs showcased their latest concepts in front of potential investors. McCartney Multimedia's role is to assist these upcoming companies with branding and marketing. A win win combination. Press release to follow soon. KiwiTech’s founders have a successful entrepreneurial track record having built a previous company into a market leading publishing services company with over 5,000 employees globally. The founding team is leveraging their decades of content and digital technology expertise by selectively partnering with technology startups. Visit site. Linda McCartney at her Ranch in Tucson, AZ. Photography, horses and animal rights were among her interests outside of music. She also inspired a number of songs, most of which were composed by Paul. But the first one was written when she was just a little girl. Her father, entertainment lawyer Lee Eastman, asked one of his clients, Jack Lawrence, to write a song using his daughter’s name. The result was “Linda,” which has been recorded by many artists. It was a hit in 1947 for Buddy Clark and the Ray Noble Orchestra. Find out more at McCartney Times. Was your data shared by #CambridgeAnalytica? After Mark Zuckerberg's testimony in front of Congress, it is vital that you check your personal information online, and see if it has been shared or even sold to a third party entity, that you didn't authorize or give permission to do so. Log in to Facebook then click this FB link to find out immediately. We hope you've enjoyed Volume 34 of the McCartney Multimedia, Inc. newsletter. If you'd like to know more about us and keep up with events and news, please feel free to visit our"Newsletter" Archive which can be found here. ©2018 McCartney Multimedia, Inc. All right reserved.